After a pretty rough first trimester, I sailed through my second. Everything people said about those middle months was true: you get the good kind of hormones, feel happy, get that glow (or in my case, go to Sephora and buy a $32 blush because you really, really want that glow), the nausea goes away, you get to feel your cute little fetal parasite use you as an inside out punching bag for the first time. Glorious! I loved everything about it. Towards the very end of my second trimester, I started to get some occasional, nagging back pain, always in the middle right of my back, sort of under my shoulder blade. I thought it was just a sleeping-on-it-funny thing, and it would come and go. Fast forward a few weeks, and it’s become a constant, someone-is-slowly-stabbing-me-with-a-jagged-dagger-all-day situation. I’ve tried heat, ice, massage (husband, not professional), tiger balm, Tylenol, yoga stretches, and 2 chiropractors. I’ve asked nurses, doctors, and midwives what to do about it. So far, nothing has brought any consistent relief. I have a newfound respect and sympathy for anyone suffering any kind of chronic pain. Also a lot of medical bills. Chiropractors are pretty expensive considering they may or may not be actual doctors (my desperation outweighs my skepticism). The one I’m seeing now treats hockey players which I think is a good sign. Pregnancy is a lot like hockey: full body assault, and you might lose some teeth (I lost half of one last week, but that’s another story). 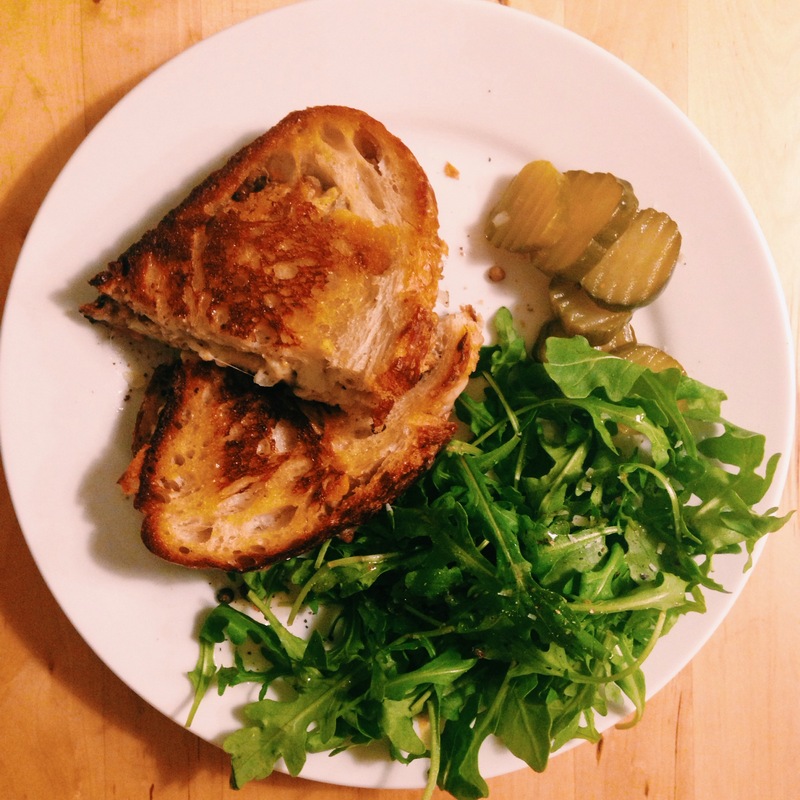 Anyway, there is one thing in this world that always makes everything better: grilled cheese. It makes first trimester nausea subside, gives the baby a reason to somersault cutely in trimester two (at least this baby loves her carbs), and now in the third, it still brings its little comforts. As a bonus, it’s easy to hold and eat with one hand while you balance a plate on your huge belly and readjust the ice pack under your back. This particular grilled cheese was made with good sourdough bread slathered in mustard and layered with shredded gruyere, a handful of cooked lentils, and a few threads of sauerkraut (a nod to the classic Reuben). Served with a pile of pickles and arugula. Little Goose: you are welcome for that sandwich. I know you liked it because you keep kicking me in the bladder. I’m cool with that, as long as you’ll at least consider unwedging your tiny feet from my ribcage. I wish fetuses weren’t too young/unborn to negotiate.